Writers employing simile invite danger into their prose. The temptation to cobble two items together to paint a vivid picture for the reader often leads to vague and ridiculous bedfellows. Despite the cultural touchstones of leaders like Forrest Gump (“Life is like a box of chocolates…”), simile used without forethought descends into the absurd: Life is nothing like a box of chocolates, which have the varieties printed on the inside of the cover, for the very purpose of avoiding the unknown that Mr. Gump and his mother were trying to explain. So when I say that innkeeping is like the Tour de France, I understand fully the pitfalls awaiting. I’m guessing most readers have never watched the Tour de France—or, as it’s referred to in France, Le Tour. On the surface, grand tour bike racing (where racers spend up to three weeks racing a single race) may appear to many as a ridiculous way to contest sport. From 10,000 feet, it looks like the same thing over and over: Preying Mantis-shaped humans climb aboard space ships disguised as bicycles, then spend most of their time huddled in a great mass, until they’re 300 meters from the finish, when they all start sprinting, and after 200 kilometers somebody wins. Looking at innkeeping from the same time and distance produces not dissimilar results: people check in, the innkeepers educated them on the local offerings, breakfast is served the next morning, people depart, room are cleaned…and then people check in again. 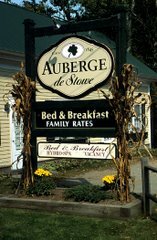 While the cycle for innkeepers is not three weeks, it’s still a cycle: winter, summer, autumn; check-in, sleep, eat breakfast; lather, rinse, repeat. But drill down into these two things and differences are nuanced, at best. Le Tour—and its two other grand tour bookends, the Giro d’Italia and La Vuelta a Espana—is one of the most human cultural events to happen in sport. Riders are on teams, and the teams race together and against each other year after year. During the race, riders converse and plot with each other—even if they’re not on the same team. For instance, during one of the stages this year, Daniel Teklehaimanot, an Eritrean riding for team MTN-QHUBKA, won the right to wear the Polka Dot Jersey signifying the best climber so far During one stage that featured three climbs, all with points at stake, Teklahaimanot was discussing strategy with the two other cyclists who were in the chase for that jersey. After some conversation between them while riding, the two other riders deferred to Teklahaimanot, allowing him to become the first African to win the King of the Mountain Jersey during a stage of Le Tour. The breakfast room hosts similar declamations from innkeepers imparting local knowledge.